Over the years, I’ve had some good nights at the Common Room on Devonshire Street, but they’ve all been liquid-based – and to be honest, the menu had never given me that burning desire to order anything more substantial than booze. However, I recently found myself at the Common Room for a work’s do, stomach grumbling at the sight of my co-workers’ burgers, and wishing I’d ordered something for myself (rather just plundering the staff bar). After that, it was only a matter of time before I found myself at the Common Room again, this time with food in mind. The Common Room is an enormous venue, with a definite sport’s obsession. Take a wrong turn at the bar, and you’ll find yourself in a warren of pool rooms. Sit, well, practically anywhere, and your eyes will naturally come to rest on one of the many television screens that line the walls (and those televisions are always showing – you guessed it, sport). The Common Room has a fantastic atmosphere when there’s a game on, and the sheer size of the place means you stand a chance at getting a seat, even when there’s something popular on the T.V screens. In addition to the pool rooms, there’s an area around the bar that’s all about the comfy booths, and a separate dining area. The dining area is a contrast to the dark wooden beams and exposed brickwork of the rest of the Common Room; it’s bright, airy and has a canteen feel to it. One look at the menu, and this change of decor makes sense; the Common Room’s grub is pure American diner. We took our seats in the dining area and were surprised when the waitress came over and requested a debit or credit card, which they kept behind the bar until we’d finished our meal. This isn’t a policy I’ve encountered in Sheffield before! After handing over a card, it was time to take a closer look at the menu. 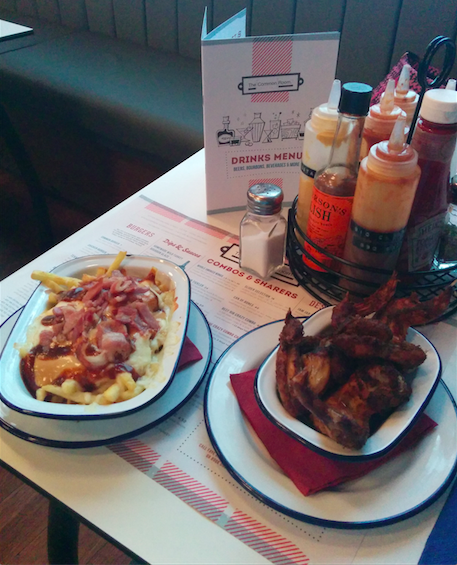 The Common Room is very loyal to its American diner theme, with a focus on burgers, chips, hot dogs, and ribs, not to mention a few nicely authentic touches, such as corn chips, cherry soda, and root beer. There’s also some really innovative sauces on offer that’ll please the adventurous eater – don’t worry, this isn’t a boring ‘chips and a burger’ place! I opted for a veggie burger (£7.00), more for the accompaniments than anything else. The menu promised a burger filled with salsa, cheese, burger sauce, and a “green chili slaw” that I couldn’t wait to try. When my meal arrived, I was pleased to see they hadn’t been stingy with the slaw – I had an entire tin can full of the stuff, and the slaw itself looked chunky and homemade. There was also a decent portion of fries, served in a little blue and white jug. 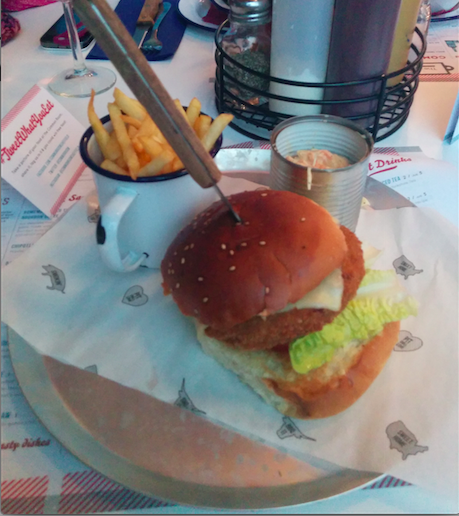 Despite the big portion of fries and slaw, the burger itself didn’t look particularly exciting. The single patty, one lettuce leaf and square slice of cheese, left the burger bun looking a bit sad and empty. However, I was pleasantly surprised when I started chowing down, the veggie patty was chunky and full of identifiable veggies (always better than vegetable mulch! ); the square of cheese didn’t have the plastic taste I’d been dreading; and the salsa and burger sauce made this rather plain-looking burger really tasty! When I finally got around to that rustic-looking slaw, it was every bit as yummy as I’d hoped. Those fresh, crunchy veggies in creamy sauce, turned my run-of-the-mill french fries into a treat, and I piled on the slaw enthusiastically. My only niggling disappointment, was that I’d expected anything called ‘chili slaw’ to pack a punch, and it wasn’t in the least bit spicy. At the other end of the table, my dining companion decided to treat herself to some equally guilty grub: a feast of Bacon Fries (£4.95) and Starter Wings (£3.50). Bacon fries are one of those so-wrong-it’s-right dishes; a celebration of everything that’s bad for you, in the form of french fries, piled high with bacon and cheese, and finished off with a winning trio of cheese sauce, baconnaise (that’s bacon flavoured mayo!) and BBQ sauce. When you wake up with a hangover, this is everything you crave, packed into one calorie-laden dish. The bacon was thick and grease-free, while the cheese had a good flavour to it, and the combination of cheese sauce and baconnaise sealed the deal. It was thumbs up for the bacon fries! At £3.50, the Starter Wings turned out to be a value-for-money pile of chicken wings, which were dark and sticky with the Common Room’s Wild Turkey Bourbon glaze. There was even a bonus helping of sauce in the bottom of the bowl, which helped keep the chicken wings moist. There’s enough interesting flourishes on the Common Room’s menu to lure you back for a repeat visit, and the place definitely has an artistic flair when it comes to sauces (scotch bonnet jam, or banana ketchup, anyone?) This may not be the place to go for a slap up meal, but sometimes you have a hunger that only big burgers, fries, and bacon-flavoured mayonnaise can satisfy. If you’re in town and want something quick, filling, and a little bit naughty, the Common Room is worth a visit – as long as you’re not on a diet! I walk past the Italian Kitchen at least twice a day, on my way to and from work, and every time I ask myself “why haven’t I eaten there yet?” After a few months of making mental notes to pop into the Italian Kitchen, I finally ended up in the Ecclesall Road restaurant by accident, after spending longer than I’d intended in the Nursery Tavern (whoops), and getting a case of the beer munchies. Nipping across the road and filling up on yummy Italian food seemed like the perfect way to finish off the evening. Despite it being a rainy, mid-week night, the Italian Kitchen was surprisingly busy. This eatery has a very cosy vibe, with a preference for low lighting and dark furnishings, which is very welcoming – especially on a rainy and windy January night! We scored a window seat, so we could watch the pedestrians getting blown around Ecclesall Road while we settled down with our wine, and perused the menu. The menu is typical for an Italian restaurant; that means pizza, pasta, risotto, and steak. There’s nothing really out of the ordinary here, and the prices are pretty average for this kind of food. So far, so good. Still hung up on the previous week’s Loch Fyne treat, I couldn’t resist the lure of the fish dishes, and opted for the Linguini Marinara (9.95), which promised a trio of seafood: mussels, prawns, and squid. It pretty much goes without saying that the seafood couldn’t compete with Loch Fyne (which specialises in seafood and is more expensive, after all) but I was pleasantly surprised by the sheer amount of seafood the Italian Kitchen piled onto my plate. All too often a seafood-pasta dish turns out to be four mussels-in-their-shells, strategically positioned on top of a pile of pasta, with a handful of prawns and calamari rings thrown in (if you’re lucky!) 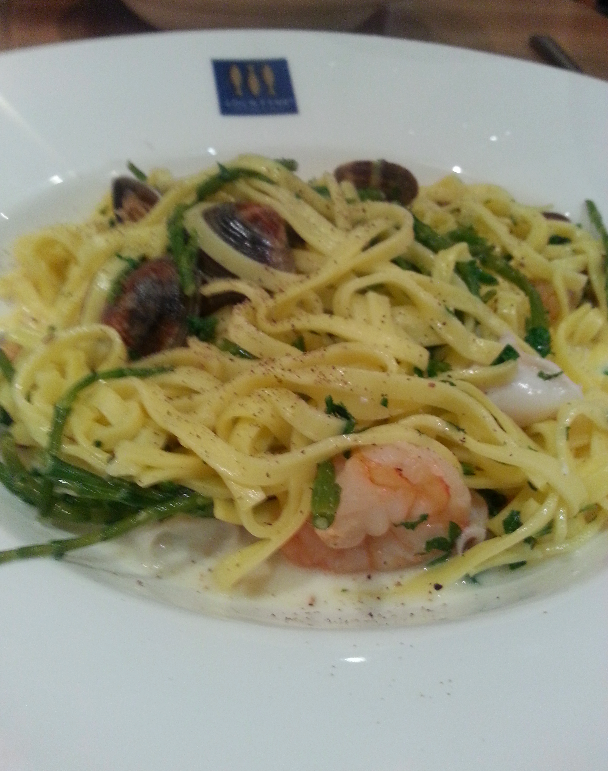 Not so at the Italian Kitchen; every forkful of linguine brought with it a generous helping of seafood. Even when I reached the bottom of my pasta, there was a pile of stray seafood still sitting in the bottom of the bowl. 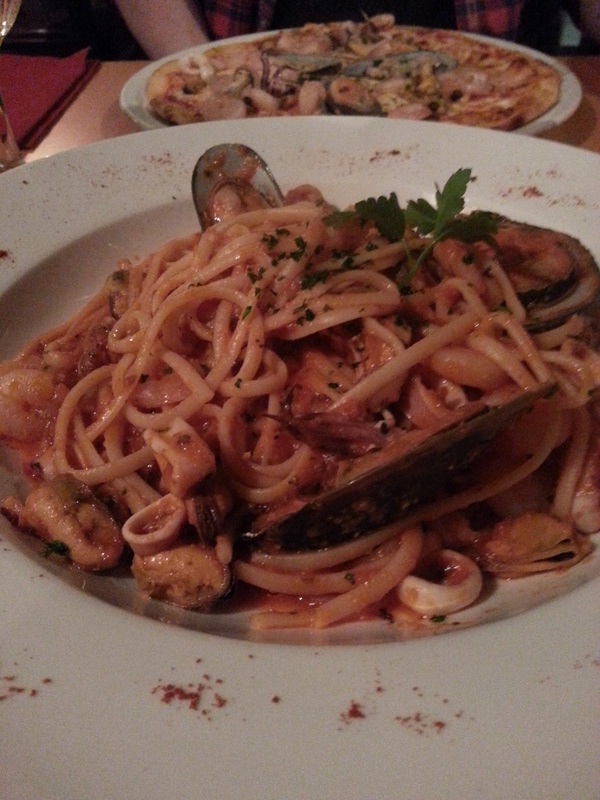 I don’t think I’ve ever been treated to so much seafood in a pasta dish before. Other restaurants, take note! The seafood was nicely cooked and not in the least bit rubbery, and it had a hum of garlic going on, although I wouldn’t have minded a hotter kick (a bit of chilli in the tomato sauce would have sealed the deal for me). But overall, a tasty, generous dish that’s filling and good value for money. 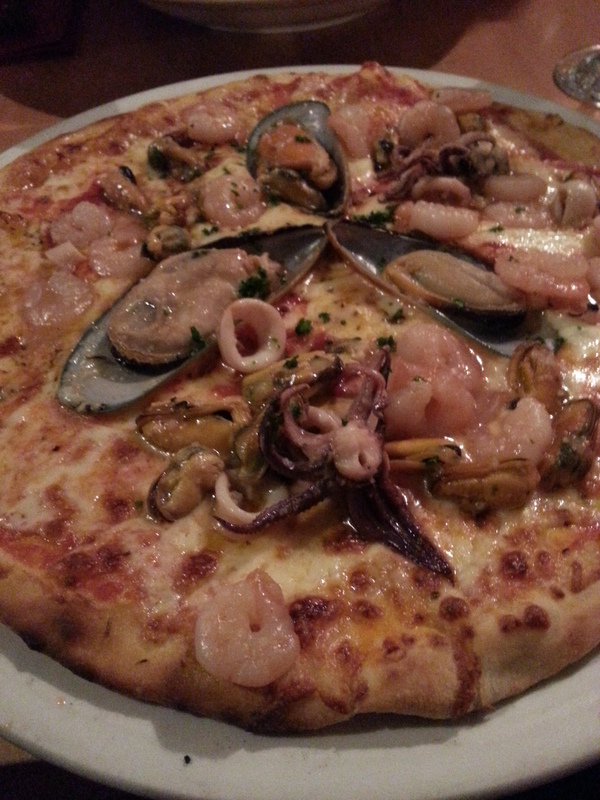 Once again, it was all about the seafood, as my dinner date ordered a Marinara Pizza (9.95) of prawns, mussels, and squid, with some garlic to season. The Italian Kitchen didn’t disappoint, delivering a pizza piled high with seafood, which left us debating which was the better option for seafood lovers – pizza, or pasta? If you’re a fish fan, you can’t really go wrong. Pizza or pasta, the Italian Kitchen make sure you get your fill. With two seafood-packed meals for just under 20, we reluctantly left the warmth of the Italian Kitchen, for the cold and rain of Eccy Road, feeling like we’d enjoyed a great meal, at a great price. A generous portion of tasty Italian grub at reasonable prices in comfortable surroundings – what’s not to like? Seafood restaurant Loch Fyne has a special place in my heart – to me, it’ll always be the place where I celebrated getting my first job after university. Fast forward far-too-many-years, and a trip to Loch Fyne on Glossop Road still feels like a bit of a treat. Maybe because it’s slightly away from the other city center restaurants, so you never really pop in on a whim; maybe it’s the light, breezy decor and sense of space inside; or maybe it’s the massive, glinting crushed-ice-and-seafood display that dazzles you when you first walk into the place. If you’re a seafood fanatic, then Loch Fyne’s menu is like a roll call of all your favourites: crab, prawns, lobster, oysters, and mussels, not to mention a wide selection of fish (tuna, cod, and bream, to name a few). There’s also a smattering of meat dishes, so anyone who winds up in Loch Fyne because they got their arm twisted by their seafood-loving friends is well catered for. 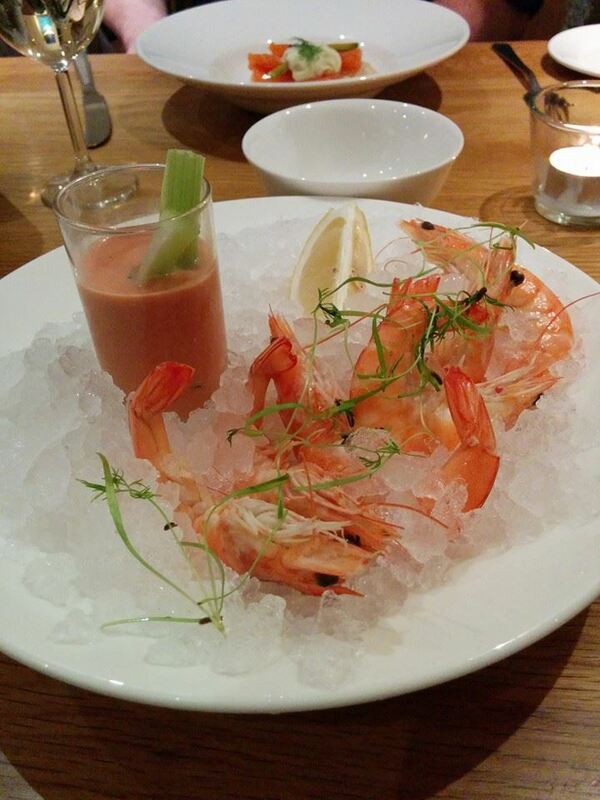 To kick off this fishy feast, I ordered a starter of crevettes, served on ice with an intriguing-sounding Bloody Mary sauce (£6.75). This turned out to be my dream starter; a big bowl of crushed ice and massive crevettes, not to mention the Bloody Mary sauce itself, which arrived ice-cold, served in a shot glass and garnished with a stick of celery. The starter tasted every bit as good as it looked. The crevettes had that seaside-fresh taste, but the sauce truly was the star of the show. The Bloody Mary sauce had all the creaminess of Marie Rose sauce, combined with a fierce chilli kick and a nice hint of vodka. After dispatching of the crevettes, I shamelessly used the celery to scoop out every last morsel of sauce. Loch Fyne, if you ever bottle that stuff, I’ll be the first in line! At the other end of the table, it was all about the Smoked Salmon Ashet (£8.45), a very gourmet-sounding combination of smoked salmon, Gravadlax, and Kinglas fillet, served with creme fraiche and dill, which also got a big thumbs up. With the bar already set pretty high, I was glad that I’d ordered something equally special for my main meal: Lobster Spaghetti (£16.95); a belly-busting bowl of spaghetti in tomato sauce, with generous chunks of lobster. The menu stated that the spaghetti came in a tomato herb, brandy and cream sauce, but all the other ingredients were completely overwhelmed by the taste of lobster. Personally, I love lobster, so this was no great hardship, but it would have been nice to get the occasional hint of the other ingredients. This definitely isn’t a dish for anyone who wants to dabble with lobster for the first time; it’s a very strong, very fishy dish – but personally, I loved every forkfull. My dining companion opted for the Seafood Tagliatelle (£14.95), a bowl of scallops, clams, squid and samphire, pan-fried with garlic and shallots, in a white wine and cream sauce. Again, Loch Fyne weren’t stingy when it came to portion size, and the generous heap of tagliatelle was mixed up with plenty of nicely-cooked seafood. A bit more of a balanced dish than my lobster spaghetti; you could taste the sauce and the pasta, and not just the seafood. 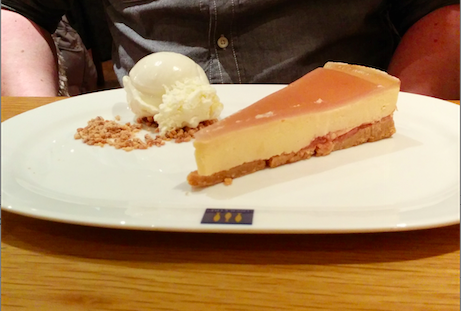 There was just enough time to squeeze in a round of Rhubarb and Custard Cheesecake (£5.25 each). This innocent-looking sliver of cheesecake was deceptively heavy, making for a very creamy and indulgent end to our meal. With a bottle of white wine thrown in (another £14.25), the bill came to just shy of £55 for two people. True, Loch Fyne is more expensive than your run-of-the-mill meal for two, but it’s not extortionately priced for a seafood restaurant. 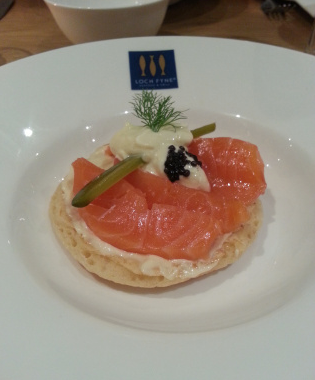 Loch Fyne is a treat for seafood lovers; an upmarket feeling restaurant with a classy vibe that’s just enough off the beaten track to feel a bit special. Find an excuse to celebrate, and treat yourself to a Loch Fyne fish feast!